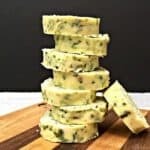 Butter flavored with fresh cilantro, shallots, and lime. Perfect for melting over cooked chicken or fish. Place butter in a mixing bowl. Mix until smooth and soft. Add remaining ingredients. Mix just until all ingredients are incorporated. Place butter mixture onto a piece of waxed paper. When needed, simply cut off a slice and use.